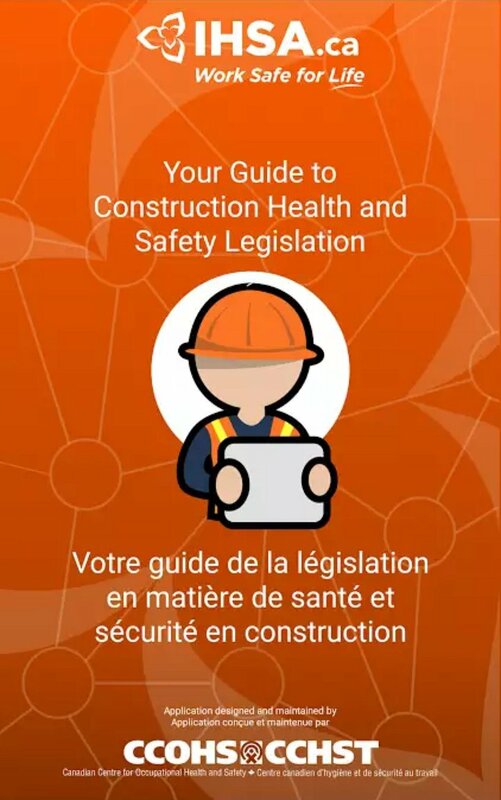 Your Guide to Construction Health and Safety Legislation in Ontario. This Guide is designed to provide Ontario workplaces an understanding of the Construction Projects Regulation under the Occupational Health and Safety Act of Ontario. The Guide to Construction Health and Safety Legislation provides information on 50 topics. The topics are available in English and French. Bring Safety Home is a resource for parents, helping them to connect with their children, ensuring they have healthy and safe workplace experiences. This initiative is enabling parents to play a positive and proactive role ensuring their children have a safe experience while starting their first jobs. CCOHS fulfills its mandate to promote workplace health and safety, and encourage attitudes and methods that will lead to improved worker physical and mental health, through a wide range of products and services. The Centre for Addiction and Mental Health (CAMH) is Canada's largest mental health and addiction teaching hospital, which combines clinical care, research, education, policy development and health promotion to help transform the lives of people affected by mental health and addiction issues. The Ministry of Labour has created some Easy to Use Employment Standards tools and calculators as a resource to help you be in compliance with the ESA, 2000. From the Public Holiday Pay Calculator to the Severance and Termination Tools, these are some great resources for small to medium sized businesses. We use our muscles, tendons, ligaments and joints to lift, carry, sit, stand, walk, move and work in a variety of ways. Use these ergonomics tools to ensure you don't put too much demand on your body at work! Great West life offers financial solutions that meet the needs of individuals, families and business owners. There flexible and innovative benefits can be tailored to fit the specific needs of your business, whether large or small. Kingston Partners for a Safe Community is a not-for-profit, charitable organization which provides activities and programs aimed at reducing injuries and preventable deaths, along with promoting safety within our community. The Live Well Centre is committed to helping people achieve optimum health and perofm at theirs personal best. Through its programs and services, the Ministry of Community and Social Services: helps adults with a developmental disability live, work and participate in a range of community activities, enforces support orders issued by the courts so that families get the money to which they are entitled, and helps Ontarians recover from hardship and regain control of their lives. Through the ministry's key areas of occupational health and safety, employment rights and responsibilities, and labour relations, the ministry's mandate is to set, communicate and enforce workplace standards while encouraging greater workplace self-reliance. The OEA provides Ontario employers with expert, free and confidential advice, representation and education on all workers' compensation issues under the Workplace Safety and Insurance Act, and on unjust reprisal issues under theOccupational Health and Safety Act. As Canada adapts to the legalized use of cannabis, professionals from all industries are looking for answers on a wide range of issues — including production and supply, the workplace, regulatory regimes, crime and the impact on business.